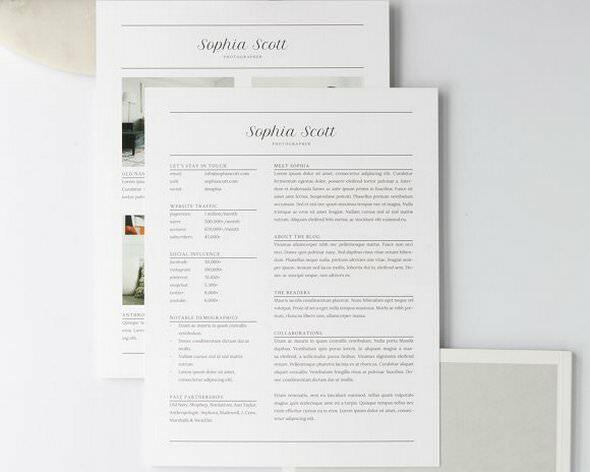 Sophia Media Kit Template includes a two-sided layout for Adobe InDesign, Apple Pages, and Microsoft Word. Customize the templates with your colors, fonts, and headings to create a blog resume that is uniquely yours and ideal for potential brand collaborations. If you are a blogger ready to take your blog to the next level, this media kit will help you stand out to brands! A media kit summarizes your blog’s services, statics, view demographics, and social following. A cohesive, professional media kit is the perfect way to represent your brand as you reach out to potential sponsors and collaborators. This media kit will save you time. Simply replace the filler text with your own information. You can keep the default styling, or customize the colors, fonts, layout, and features to your preferences!